Boom, B.J, Spampinato, C, Palazzo, S, Huang, P.X, Beyan, C, He, J, … Fisher, R.B. (2013). 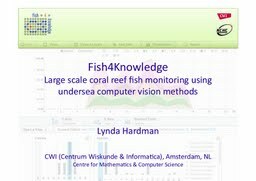 Fish4Knowledge- large scale coral reef fish monitoring using undersea computer vision methods.